The Gordon Highlanders was one of the great names of Scotland's history, and one of the British Army's most celebrated regiments. 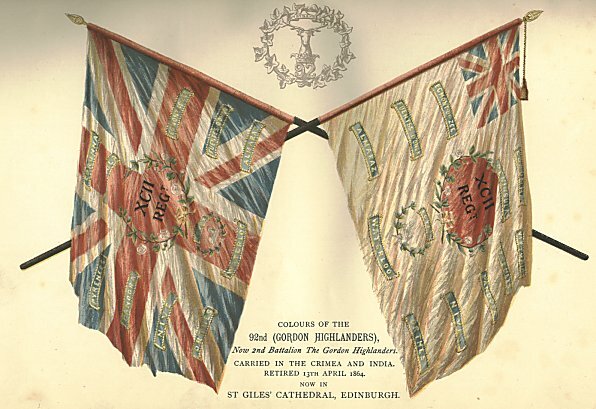 It was the local regiment of the North East of Scotland, recruiting mainly from Aberdeenshire, Banffshire and Kincardineshire, an area which took great pride in the Regiment's record. Raising the regiment, The Duchess of Gordon’s bounty, The Lochaber men and Captain John Cameron, First list of officers, Thoroughly Highland character of the Gordon Highlanders, M‘Kinnon the bard, First five years of service, Ireland, Holland, Egmont-op-Zee, Sir John Moore’s regard for the regiment, Egypt, Severe losses of the regiment, M’Kinnon’s poem on the battle of Alexandria, Ireland, Glasgow, Weeley, Copenhagen, Sweden, Portugal, Walcheren, Peninsula, Fuentes d’Onor, Arroyo de Molinos, Almaraz, Alba de Tormes, Vittoria, Pyrenees, Maya, 92nd disregards orders, Nive, Orthes, Aire, Ireland, 2nd battalion disbanded, Brussels, Quatre Bras, Colonel John Cameron, Waterloo, Paris, Home. Ireland, Jamaica, Terrible losses from Yellow Fever, Colonelcy of the 92nd, Scotland, Ireland, New Colours, Gibraltar, Malta, Barbadoes, Scotland, Ireland, Ionian Islands, Gibraltar, Large numbers volunteer into Crimean regiments,Re-enlist in 92nd at first opportunity, Regiment goes to the Crimea, Return to Gibraltar, India, The Mutiny, Employed in Central Provinces. Performs much harassing work, Field service, Oojein, Harassing marches, Engagement near Bajghur, Mungrowlee, Combined movernents, Sindwaho, Koraya, Rajpoor, Fatigueing work in the Bunswarra country, Mhow, Jhansi, Lullutpoor, Seepree, the Bundelcund Jungle, Importance of work performed by 92nd, Dugshai, Its various stations in India, Authorised to use designation of "Gordon Highlanders", Home, Gosport, Edinburgh, Presentation of New Colours, Glasgow, Aldershot, Ireland, Aids the civil power, Leaves its New Year’s dinner cooking, India again, Julinder, Camp of exercise at Delhi, Chukrata, Proceeds to Mooltan. Mooltan, Guard of Honour for the Prince of Wales at Lahore, Farewell Order of Colonel Cameron, Sitapur and Benares, Proceeds on Active Service to Afghanistan, Au Kheyl, Karatiga, Charasiah, Asmai Heights, Kabul, Argandab, Sherpore Cantonments, Childuckteran, The March from Kabul to Kandahar, Rewards for Services in Afghanistan, Leaves Kabul for England, Destination changed to Natal, Durban, March to Newcastle, Mount Prospect Camp, The disaster at Majuba Hill, Bennett’s Drift Camp, Departure for Home, Portsmouth, Edinburgh, Deposition of Old Colours of Scottish Regiments in St Giles’ Cathedral, The Channel Islands. In the First World War some 50,000 Gordons served in the regular, territorial and service battalions. Of these, approximately 27,000 were killed or wounded. Among other great and terrible battles, all the fighting Gordon battalions saw action on the Somme. In the Second World War, Gordon battalions served with the British Expeditionary Force in France in 1940, and in the Far East in 1942, where many became prisoners of war. Great success was achieved in the North Africa campaign, in Sicily and Italy, in the invasion of North West Europe followed by the long advance into Germany, and in the liberation of Burma. In the years after 1945, the Regiment took part in peace-keeping and anti-terrorist operations in Malaya, Borneo, Cyprus, Germany and Northern Ireland, with detachments serving in the Gulf War and Bosnia. In 1994, the Regiment was amalgamated to become part of the Highlanders (Seaforth, Gordons and Camerons) - the new regiment of the north of Scotland. 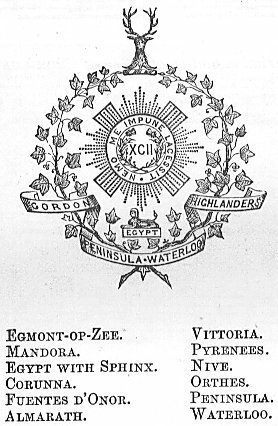 The Gordon Highlanders was renowned as a courageous fighting regiment, but also enjoyed a reputation for good conduct and all round ability. This was based in a particular approach to soldiering, a professional attitude individually and collectively where steadiness and teamwork were as important as extraordinary courage, sustained by a healthy pride in the Regiment and its achievements.